SORRY FOR THE DELAY.... I knew what I wanted to share as I woke last night with an image I knew I was meant to share. However, I met a friend at 5:(GASP)30 this morning and with that I concluded I should wait on my share and allow the image to speak to me. Because it wasn't so much the image as Jesus. While in Portland this past weekend, Julie and I went on a mini mission. On that mission I met 7 people. I was intentional on getting their names, as it was important to me to know who it was I could be praying over. The first person, JP, then there was the couple at Denny's (we didn't get their names and I'm not going to lie, they scared me a tiny bit). There was Owen and the Vietnam Vet. There was Nick and there was the person under the red blanket, trying to tune out the world and stay warm. I've been praying over this crew of people. Seeking Jesus on their behalf to bless them in unexpected ways. Last night I woke in the middle of the night with this image of Jesus, holding up JP's face with His hands and looking deep into JP's smile. I can't explain it. JP didn't have great teeth, he didn't have clean teeth, but what he had was a smile. A smile filled with joy. He was so grateful for Julie and I to stop, to speak with him, to love him. His smile still makes me smile ~ it was precious. In my image, Jesus is holding JP's face in His hands and He is speaking words of blessing over him. My heart was full as I lie there thinking, one day JP is going to see this himself, if he hasn't seen it yet. One day, Jesus is going to be so happy to see JP and his smile and He is going to hold his face in the palms of His Hands. Ohhh what a wonderful day that will be! I look forward to it for JP. And I think about Owen, who was so grateful and so kind. So quiet. And Nick. Who sat at the same table for a very very long time "waiting for a friend". I think about Nick, he was young. His entire life ahead of him. I think about his eyes, they looked at me with a wonderment. Touching. Our purpose was to bless others. Jesus blessed us in such a way it was bless others and be blessed. Oh He is so abundantly and amazingly good. Will I see these people again? In heaven I believe I will. And I believe when we are there together, we'll remember that day as though it was the present. Awww see there... THE PRESENT. Once again, Jesus is doing abundantly more than we could begin to imagine. Thank you Jesus for the sweet image you placed in my heart and thank you Jesus for filling me with smiles from strangers. I ask you bless and keep them in unexpected ways Lord. Thank you for the gift of the experience shared with my sweet friend and thank you Jesus for reminding me daily how blessed I am and for allowing me to bless and be blessed by others. I am trying to find the humor in my situation today. I know God has a sense of humor, I see it often. Today no exception! My friend opened a salon which specializes in eye last extensions. When she began this journey, which was a step in faith for her ~ I thought YOU GO GIRL and I made a decision, I was going to support not only my friend. But my dream of finally having eye lashes…. Ahhhh. I then looked into this dream a bit further SIDE NOTE: if you truly know me, you know I don’t just “go for it” although I’d like to pretend I’m a fly by the seat of my pants kinda gal. I am not. I tend to over think. I over analyze and I over talk- meaning I’m a big talker. When I say I’m going to order the fish and chips for instance – my family knows I’m lying. I would like to think I’d actually order it, but I never will. Guilt overwhelms me and I feel the grease clogging my arteries before the waitress ever returns to take the order. Okay all of that said. I was excited about eye lashes and so I did my research. I logged on to see what kind of investment I was going to be making. O U C H. I had no idea the price of beauty! My routine is very minimalist and I don’t do a lot of “me” pampering. It’s a big deal if I pay more than $5 for nail polish! So when I realized the price to have beautiful eye lashes was a grocery bill ~ I was OUT! I couldn’t justify it. And then there was the returning to have them “filled” every few weeks. Now, let me share, they do look FABULOUS on those I’ve seen and I would SO love the look, but just as quickly as I was dreaming about washing my face to lie down and have the lashes put on, I was putting on mascara and telling myself I was happy with my lashes just like they are. These are the lashes Jesus gave me after all – yeah, Thanks Man! Fast forward a few weeks later, some seriously stressful situations for which I found myself in the midst of and flair up. I have an auto immune disease, when I am stressed it flares. When it flares, I loose hair. OK. That said, I look in the mirror as I’m getting ready for bed one night and notice there is a small section of eyelashes missing. ODD. I’ve only had this happen one other time, a time when I was VERY stressed. My heart sinks and I think to myself, it’s a small section – I am a wonder woman with mascara, I can work through this. And I do. No big deal, well Okay I really big fake like it’s no big deal as I try and make it through. A few days later MORE lashes gone. Now I’m down to a very small section which isn’t really looking to great. I am not going to lie. I was a little upset with Jesus at this point ~ I can handle the hair falling out on my head, as I’ve mastered hiding that after many years, but this. I look like a weirdo with lashes on ONE EYE. OK weirdo is a bit strong. But you get where I am going with this. This morning I posted a photo of my naked eye on Instagram. Funny the friends who reached out with sympathy and suggestions (THANK YOU). They get me, they get we’re girls and eye lashes are JUST lashes but they are more. I took a short break and went for a drive this afternoon. I thought HOW TERRIBLE! I’m having a mini cry baby break down over losing eyelashes. EYE LASHES and there are women who are missing limbs! Who don’t have fingers. Who have no hair on their head. Who never had even slight eye lashes. Who are missing breasts. Who are missing feet. Who have greater and bigger issues than I can even begin to imagine and I’m whining because I’m missing eye lashes. God humbled me. He nudged me and reminded me He really did make me beautiful and wonderfully made. He reminded me how blessed I am to have a healthy body. He reminded me how blessed I am to have control (most of the time!) over my lupus. He reminded me He knows every hair on my head and those falling to the floor. He reminded me He knows my eyelashes are missing and then He reminded me… stop being self-absorbed. He reminded me to look at ME like I would look at others. With love. Without conditions and with a heart that sees the beauty in the ashes. NOT in the eye lashes. Ohhh Thank you Jesus. He reminded me sometimes it takes a HARD NUDGE to bring us back to Him and a message He needs to share. He removed my lashes because they were in the way of seeing the beauty in the blessings I do have. Awww well played Lord! And as I have this conversation with Him in my car, sharing my heart and my understanding the thought came into my head and I’m certain it was Jesus ~bringing humor to my day..... why couldn’t He have removed the hair from my legs, I know that would have gotten my attention too! and He smiles, Oh but that wouldn’t have led me to Him. I truly believe All Things Are from God and God Is Good in All Things! Thank you Jesus for the many (MANY) blessings I find myself overlooking. And thank you for the sometimes painful (vainful) reminders. WE ARE ENOUGH! And we are Beautifully and Wonderfully Made by you. Oh if there was a dash cam in my car ~ the world would see the real, the raw, the true blue me. I sing (loud) with the radio which is 99.9% of the time turned up far too loud. I fuss with things, wipe dust from the dash, fiddle with my mirror and I talk to myself. I also spend a great deal of time gawking at the beautiful views outside the (dirty) windows which causes me to have to divert my attention back to the road. My husband will tell you I am a terrible driver. I am so NOT a terrible driver, I am simply someone who really should have a driver so I can enjoy the time in the car without distractions! I also spend a great deal of time in prayer in my car. Some of our best conversations come while I am driving. Jesus has me right where he wants me, sitting and unable to jump up and get side tracked. He speaks to me through songs, through podcasts, through visions out the window as well as simply whispering to me on my way. My car, it would be very true to say if I had a "war room" it would be within the confines of my car. There have been many occasions when my family has seen me pull into the garage, lower the door, turn off the car to find me with my head in my hands or on the steering wheel in an attempt to continue my prayer time or to hear the end of a message. Yes, they shake their heads and go on their way. My daughter made me a string of beads, in a straight line. It was going to be a bracelet but it didn't work out. I asked her if she'd let me take it just as it was. She didn't get it at first. I told her I was going to keep them in the car and when I pray I am going to hold them... perhaps like a prayer bead. Every once in a while when she is in the car with me I'll be thinking on something and pick them up. Oh my momma heart when she asks "mom are you praying right now?" I love that she knows her momma prays and I love that she prays because of her momma's example too! I so appreciate God meets us where we are. If my "war room/prayer room" was a closet, He would meet me there. If my prayer room was the bathroom (which is can be at times!) He meets me there. If my prayer room is a shady spot in the yard, He finds me there. If my prayer room is hiding in the janitor closet at work, He meets me there. Jesus does not require a special room or place, He simply asks MEET ME. Ohhh I do love that. Thank you Jesus for meeting me where I am, for loving me in my space and for being with me in all things. So abundantly blessed to be in relationship with you, where you are present no matter where I am and willing to meet me any time, any place. Thank you Jesus! How many times have you looked back over your life and seen where God took you from what you wanted, to what He had planned for you? How many times have you stood in awe and said THANK YOU JESUS. I do this, I do this often. I don't feel it is because I'm not praying for the "right" things, I'm simply praying out of want and human nature thinking I know what I need. I have had multiple times in my life when I look back and see where God said "not now", "not that job", "not that relationship" (being male or female), "not this time", "not a chance"...And I see where He has redirected me to something so much greater than I ever imagined for myself. I have come to realize I limit God - sadly, I do this often! It isn't that I don't believe HE is capable. I doubt that I am capable and presume it's not going to be in my favor, but pray anyway. 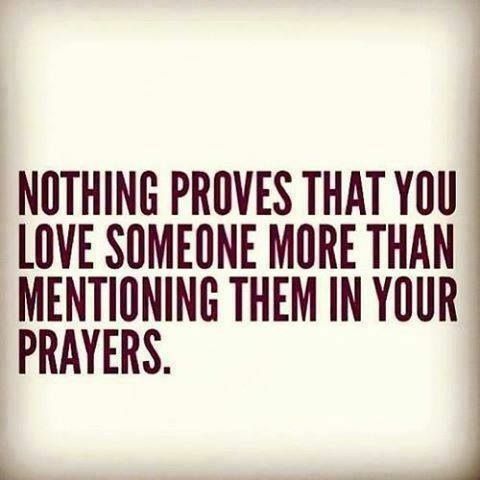 What kind of prayer is that? Half hearted. And Jesus knows, He knows what my TRUE heart is and He knows when I believe in Him but not in myself. I believe it is times like this when He reminds me HE KNOWS and HE WILL DIRECT THE PATH. This morning as I'm reflecting over things. Really thinking and taking in a deep breath to see His hands on my life, I am smiling and I'm saying THANK YOU JESUS! Sometimes when the answer was NO. I was upset. Sometimes when the answer was Not Now... I was disappointed. There are things I am prayerful for in this moment. I'm not questioning Jesus like I perhaps once did with His timing, leading or answers... I'm simply trusting. Because history has been very clear ~ when I trust Him and follow where He leads life is blessed. When I knock on the door and it doesn't open, I know He has another door and I am to praise Him in the hallway. Jesus wants so much for us, so much joy, happiness and love! Do not hesitate to ASK, SEEK and KNOCK and in doing so, always without doubt or hesitation know He is preparing you for what He has prepared for you and tell him THANK YOU, because I promise with all that I am, HIS PLANS are exceedingly amazing and He is protecting, directing and leading you to a plan beyond anything you could possibly imagine! GOD IS GOOD, ALL THE TIME! Dr. Seuss and Jesus ~ oh Yes! Dr. Seuss and Jesus? I'm a think outside the box kinda gal. This week the grade schools are celebrating Dr. Seuss, and I am a fan! I have read and have many MANY of his books. The life lessons within the pages are incredible if one stops and thinks about it. In looking through quotes today I found this one... and it struck me! "Behave as if this is the day I will be remembered" ... THAT is powerful. Think about it. If today you were called home, today is the day you part from this earth, what will you be remembered for? See, powerful right. Now ask yourself this, because we do not know when we'll go home ~ we may have many MANY days or we may have but a few. What we do have is this; another day to leave the world with a piece of us. Another day to leave the world with a piece of Jesus! It isn’t because I didn’t want to share my mornings with you … I needed a few ME MORNINGS the last couple of days. I wasn’t trying to be selfish, I was seeking. I was intentional and I needing HIM TIME without influences of having to make sense. Sounds a bit silly huh? But truth is, sometimes I just need to speak with Him on my own and indulge fully in the relationship we share. I was building on the friendship, giving Him my full attention. There was a discovery on Thursday I realized or He shared is more appropriate. Sometimes when I begin my morning, pulling Him closer and wanting to share Him with you all… it is like going on a group outing. I feel a need to bring us all together so we have a great trip and a take a way that makes us smile and want more. On Thursday, I started my morning much earlier with the intention of writing later. And then I didn’t. I found I was, needing to just BE with Him. Not that I didn’t want to share with you – Ohhh I over flow with wanting to share with you!! But on my way to serving Him, with my desire to expand and share with you, I noticed I sometimes get side tracked. I hear Him speaking, I over think or speak over Him and well, I find myself sideways later in the day. UGG! On Thursday I felt His presents saying just BE with me. Do not worry about what you will share, do not over think and do not journey off on your own. Don't get side tracked today, just BE WITH ME. To be honest, it wasn’t easy. I wanted to share. I wanted to tell you, I love you and I want to spend time with you. But He was right. WE needed time. And this morning, I found myself needing to not rush our time. I needed to simply rest in Him. I needed to realize sometimes it is completely and totally fine to have Jesus all to myself and sometimes He encourages it! He doesn’t just want our time. Phewy on that. What Jesus truly desires is a relationship with us. Time is simply moments stitched together with Him. To be in relationship with Him is something completely different. As I spent time with Jesus, He spoke to my heart through a song by Lauren Daigle “TRUST”. *** SIDENOTE: In this very moment, as I’m googling the lyrics to share the song begins on KLOVE, clearly He’s present in my sharing [thank you Jesus!]!! I am needing to trust Him, to completely lie things at His feet and not pick them back up again. It isn't easy for me, but my desire is to be obedient in Him. I pick back up the little things, I pick back up the big things. It isn't lack of trust. It is lack of patience, it is my childlike "now now now" ... it is Him telling me to relax and BE in Him. To know there is not a mountain he is unable to move. There is not a water He couldn't part and there is not a question without an answer. I need to TRUST and BE completely His. Thank you for sharing this amazing journey of faith with me. Thank you for encouraging and inspiring me through your friendships. I am abundantly blessed and I do not take one moment or event or shared prayer for granted. Blessed indeed! To you my friends, I am prayerful over you on this day. For those of you who have confided in me prayers and for those of you have prayers I'm unaware of. Bless the friend reading this. Lay your hand on their hurts, lay your hand on their hearts. Lay your hands on their families. Lord I ask you bring blessings into their day, reminders of the amazing and awesome power you have to make all things new. Lord, I pray for those who are in pain due to ailment or illness. I pray over those who have hearts that hurt. I pray for the mom or dad who fears they are failing to be reassured, we all fall short and when we seek you in all things, we gain patience, perspective and understanding. I pray for the friend who struggles with their finances, may they find there are ends to the means and may they find balance. For the friend who goes to work each day to a place they are discontent, I pray you bring joys to them and you provide opportunity for them to walk through doors of encouragement and support. I pray for the friend who has addiction~ I pray the stronghold be lost and they find the strength to be stronger than the pull of what has hold of them. I pray for the friend who is in a marriage which is unhappy. I pray the joy that once was, the love which once overwhelmed them be renewed. I pray they seek you in their marriage Lord. Putting you first and lifting their spouse to you. I pray for the friend who has a celebration to share and no one to really share it with. Lord Bring blessings of friendships to them so they may share their happy news and celebration. I pray for the friends who have unspoken prayers Lord, for those prayers they keep between you and them because it is difficult to speak out loud to others, be with them Lord and bless them. Lord, we have so many things for which we are prayerful, for each of my friends I pray your will be done, your hand be upon them and joy shine through them. Lord Bless my friend reading this and share with them THEY ARE LOVED and THEY ARE PRAYED OVER. Bless them not just on this day, but each day! You don't get the same moment twice in life. We don't get a second chance to make a first impression, to see your child born, to see your child hit their first home run, to feel those "butterflies" of meeting someone special for the first time or to share that first kiss - a few relateable examples. You get one shot at most moments in this life time. You get many moments to share, but those which will stand out above all others - they are single moments stitched into the pattern of many. So, what happens when we have that one moment when we have the opportunity to share Jesus with someone and we miss it? We chicken out, we feel unsure, we doubt ourselves we don't have faith? Do we get that moment again? No, not THAT moment but perhaps another. And perhaps not. This is why I believe it is important in our daily walk, to walk as though we might be IN THAT MOMENT and not even realize it. Do you ever wonder? After my friend and I left the Rockin' Worship Roadshow a few weeks back as we walked out their was a group of "Christian's" with signs on them stating their faith in God and His coming back. On the other side were a group of non believers. In the moments we stood there we witnessed the worst example of Christ in skin.... The "Christian" crew was yelling and shouting back at the non believer and not in an excited for Jesus kinda way. As in a I KNOW WHAT I AM TALKING ABOUT YOU ARE WRONG kinda way. The non believers egged them on, shouting things back. It was ugly. The most ugly part of the situation, and there were many! Was when a "Christian" man yelled at the non believer "YOU ARE STUPID" and he didn't stop there, it went on and on and on. My friend & I were speechless. Wanting to say or do something to show not only the non believer but the "Christian" something which would be reflective of following Jesus. So we did. We walked away. I shared with my friend as we walked that "Christian" does not believe and serve the same Jesus I do. Because my Jesus wouldn't have yelled, shouted or screamed at the non believer and by no form would my Jesus have ever called him stupid. I shared with my friend, it broke my heart because that sincerely could have been the one shot to share with the non believer and here this group, professing to be Christian's were acting as anything but. They were mean spirited, hurtful, hateful and without love. My Jesus is not that. They missed their moment, and they clearly have missed many messages on what it means to serve others, to show compassion, to love without conditions and to be mindful of our actions and reactions. Today as we moved through our daily routines this week, let us pause and think about the moments, those one time shots - be it a moment shared with a stranger, a co worker, a child, a spouse, a friend. Let us be mindful of the moments which are stitched together and have much opportunity for being a BIGGER moment in life. The message at church the past few weeks has been on HOPE. Yesterday the message was given by a guest pastor who nailed it (Oh our pastor did too, but this guy drove something home for me). I am going to admit something I am not proud of and find myself a bit ashamed of as the reality set in. Remember the homeless people my friend and I served on our BURGERVILLE MISSION? I pray for each of those people who touched my life that day. I pray for JP, Owen, Nick, the Vet, the homeless under the red blanket and the couple outside of Denny's. I am not going to sugar coat this. I pray for them to be protected and their needs to be met. With Nick, I pray his life is changed. That someone will come to him and open a door of opportunity for something positive and encouraging. The others, here is where I fall so short in my faith .... I pray for protection. I was not praying for their lives to change but for them to be comforted in the life they chose to live. In the life of homelessness, I prayed for warmth, dry, food, comfortable place to lie their head. Friendly faces to greet them. But I didn't pray for opportunity or HOPE. I limited my prayers and in that I limited our God. I was praying with the heart of someone, much like them ... accepted the situation for what it was and wanted to make that situation best (in the situation) for them. I didn't pray that JP might come to find he is able to help in a Goodwill for instance, that he might be able to find function in a society which has cast him away because he has chosen to be homeless. BUT, did he choose that? I don't know his story, I only know I saw a man who appeared to be content in walking the streets of Portland with his bags and who smiled and was grateful for a few cheese burgers. I limited my prayers for him and I limited HOPE for him. It was't an easy pill to swallow. Today as I pray over each of them, I do so with a heart that sees MORE for each of them. I don't know who was under that red blanket but it very well could have been someone with amazing influence and encouragement over another, someone who might lift the blanket and seek solutions to the reasons they were there. Someone who God might used to help others who find themselves under a blanket on a cold wet sidewalk. HOPE. I am now praying with HOPE for them. I am not going to limit our God because I've limited my way of thinking, God is so amazingly wonderfully good and so incredibly capable of far more than I could begin to imagine or comprehend. This morning as I pray over those wonderfully gifted people, I pray the Lord place HOPE in them, over them and around them. I pray HIS WILL BE DONE and my small minded limited prayers expand to such HOPE over them, their lives will be touched and changed and circumstances will be far removed from what they are familiar with. I pray God hear my prayer, sees their hearts and He places HOPE in them, on them and around them, not just on this morning, but each morning. I pray God bless them in such a way they bring HOPE to others. I work for the City. Today is the deadline to submit applications for City Council. I'm not only concerned for our National Government at this time, I'm concerned for my local government. I have learned to keep my opinions to myself. I have not come to the place where I hide my beliefs, nor will I ever. And I believe this, God is truly in control and I need, WE need to believe that! As I am prayerful this morning over my own community which has enough issues on its own, I pray also for our country that is in a state of such dysfunction that people who are God fearing and logical don't even get along on the subject matter of who to support. I am praying God will make me mindful of my decisions, open my eyes to the truth and lead me in a positive direction. He will put His hand over my mouth when I disagree and give me grace to walk away when needed. At a time when our city/country is coming apart at the seams, we need to stitch it back together in prayer.